Spring break is over, kids are back at school and moms everywhere are breathing a sigh of relief at finally having their homes back to themselves!! Now, if only the weather Gods show some mercy – looks like they did not get the memo that officially, it is spring!! April showers bring May flowers they say – but what does snow in April bring?? My son is a part of his school’s newspaper club and today was a publishing party, to celebrate the end of the newspaper club for the current school year, and parents were invited. I went of course – but the word “publishing” brought a thought to my mind – oh yes – I used to write a blog that has been sitting waiting too long. Once the thought came, I just had to act on it, so here I am putting up a post after a really loooooooooooong time! 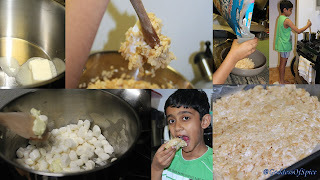 Well this one here is a recipe for rice crispie treats – nothing too fancy, a recipe right off the back of the cereal box! You could ask me why? Why bother making these treats when you could just as easily pick it off the shelf of your grocery store? And I could say, I am a big fan of DIYs, no really, I am! But the reason for my preferring to make these is because, the store bought ones have regular marshmallows in them, which contains gelatin. We are vegetarians. So, no gelatin for us. Kiddo loves rice crispie treats and marshmallows, and I have used store bought one’s in a pinch, how fussy can one be! But I do avoid it if possible. So, I buy multiple packs of vegan marshmallows wherever I find them - was difficult once, just one organic store in Hoboken carries them to my knowledge, but now we have Amazon Prime! Yay!! Don’t you just love the ease of online ordering?? BTW, these can be made in the microwave but we used the stove top and by “we” I mean me and the junior – yep, this was one of the things we did during the spring break. And for those out there raising your eyebrows over letting my kid cook over a stove top – relax! I was right next to him the whole time and the flame was at the lowest setting. But if you are frowning over this, use the microwave by all means. It would probably be quicker too, but my microwave is fixed on top of the cooking range and I use a stool to reach it! How on earth is my son supposed to reach it? And if I am the one putting it in and out of the microwave all the time, how is he going to boast about making those yummy rice crispie treats ALL BY HIMSELF? Come on, how could I take that away from him? Add the marshmallows and keep stirring over a low flame till all the marshmallows melt into the butter. Now add in the rice crispies and give your arms a good workout – go ahead and mix all the ingredients together. Remove the gooey mixture from the stove top and pour into a greased pan. Smoothen with a spatula. Let it set – takes about 10 minutes or so. Cut into desired size using a butter knife.